Anyway, it’s time for #FoodieExtravaganza! This month is being hosted by Wendy of A Day in the Life on the Farm and the theme for February is heart-healthy fiber-rich foods. 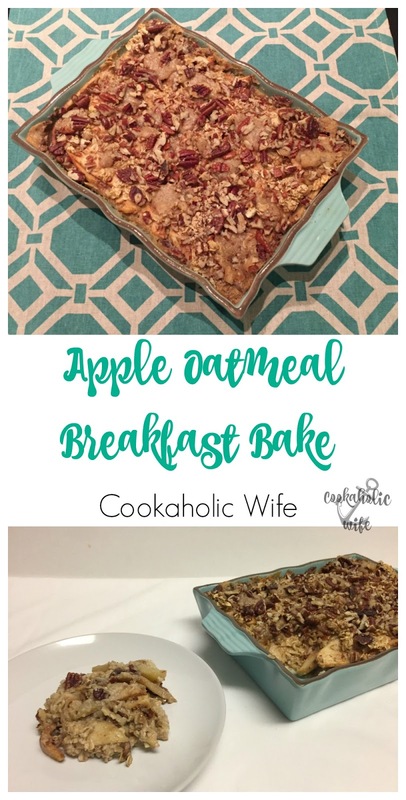 I debated on going savory and making a dish that uses beans or lentils but in the end, my sweet tooth won out and I decided to combine apples and oats into a breakfast bake. Although, it could easily be topped with a scoop of vanilla ice cream and served for dessert if you’d rather go that route! Apples and oatmeal make up these delicious breakfast bake that you can prepare on the weekend and enjoy throughout the week. 1. Preheat the oven to 350. Spray a 9×6 baking dish with cooking spray. 2. Toss the apple slices in a bowl with ½ cup of brown sugar, granulated sugar, cinnamon, nutmeg and cardamom. Set aside. 3. In a small bowl mix together 3 tablespoons of the brown sugar with the all-purpose flour and butter with a fork. Set aside. 4. 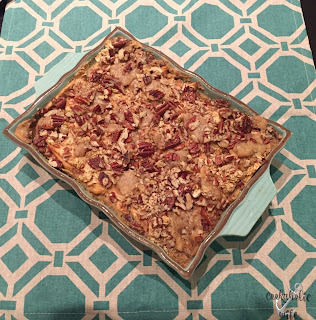 In a medium bowl, combine the remaining brown sugar with the oats, baking powder and salt. Pour the milk into a cup and whisk in the egg and vanilla. Pour over the oat mixture and stir until combined. 5. 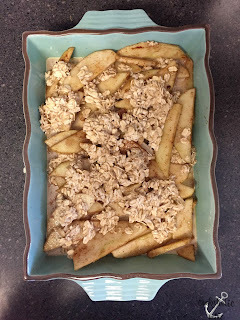 Arrange a layer (approximately ¼ of the apples) of apples on the bottom of the prepared baking dish and top with ¼ of the oatmeal mixture. Repeat, finishing with the oatmeal layer. 6. Drop dollops of the brown sugar-flour-butter mixture on top and then sprinkle the chopped pecans on top. 7. Bake for 35-45 minutes or until golden brown and the top layer is crispy. 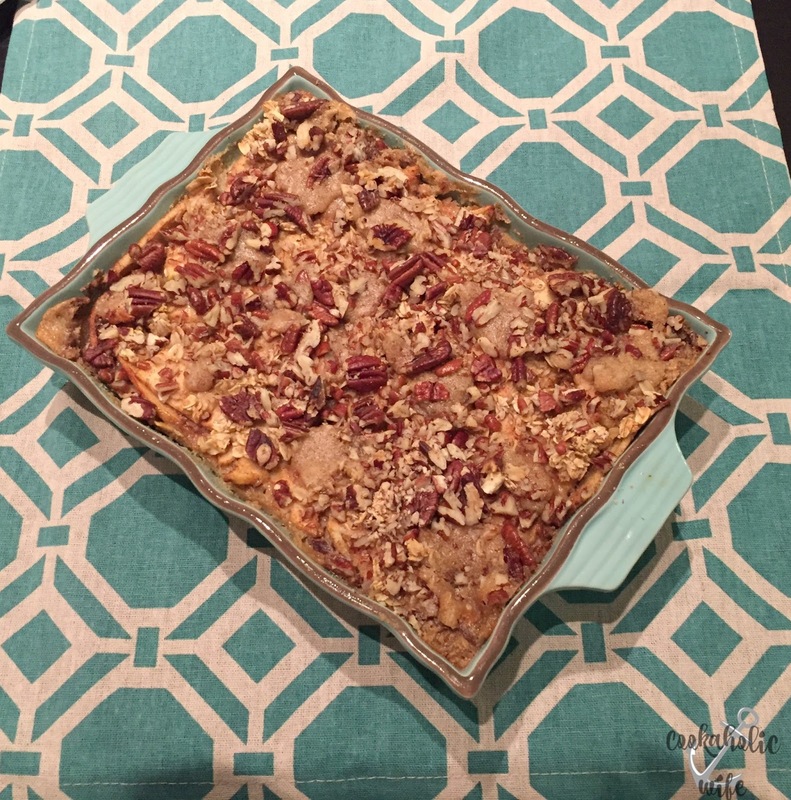 Allow to cool in the pan for 5-10 minutes before serving. 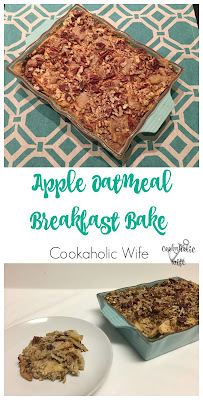 I’m not a huge fan of baked oatmeals because I think they can tend to get mushy, which is why I didn’t use very much liquid in this dish, knowing that the apples would provide a decent amount on their own. 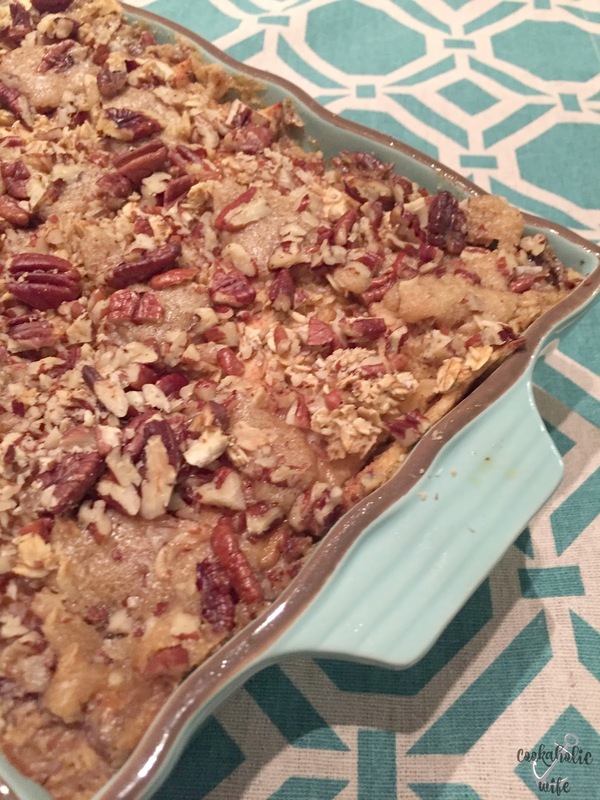 I managed to hit the mark as this is soft, but not mushy and the top studded with brown sugar crumbles and chopped pecans provides enough crunch if even soft oatmeal isn’t your thing. Great minds Nichole….from breakfast today to vacation at the end of the month. Have fun on your cruise. 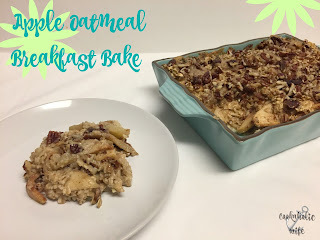 Breakfast that doubles as dessert? I'm in! this looks de-lish! Yum. That sounds fantastic. I will take it with some ice cream please. Prefect and healthy breakfast dish. Oooh I like the addition of cardamom in there!